Volume 1B. Part 2: Marketing, Distribution and Consumers. Agricultural commodity markets: spot, futures, options, forward contracts and derivatives (J. Williams). Storage and price stabilization (B. Wright). Food processing and distribution: an industrial organization approach (R.J. Sexton, N. Lavoie). Marketing margins: empirical analysis (M.K. Wohlgenant). Spatial price analysis (P.L. Fackler, B.K. Goodwin). Duality for the household: theory and applications (J.T. La France). 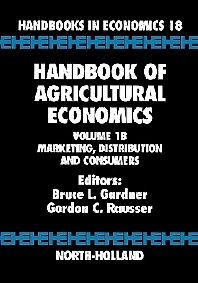 Economic analysis of food safety (J.M. Antle). Marketing and distribution: theory and statistical measurement [synthesis of 1B] (J. Vercammen, A. Schmitz). [synthesis of Volume 1] (R. Goodhue, G. Rausser).